This is a very unusual crime novel. 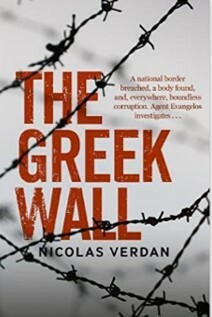 It is set in contemporary Greece, with a Greek protagonist, Agent Evangelos of Greek Intelligence, but it is written by a Swiss author, superbly translated from the French by W. Donald Wilson. It is apparently based on a true story, and this I can believe. Evangelos lives in Athens. He is ordered to travel north to the Greek/Turkish/Bulgarian borders to investigate the discovery of a severed head in a ditch near a wall which is being built to prevent Middle Eastern immigrants crossing the River Evros into Greece from Turkey. It is at the height of the Greek financial meltdown. Athens is full of violent demonstrators. Evangelos gets the impression that his superiors wish to hush up the circumstances of the murder as quickly as possible so that the story doesn't get into the press. He is not far from retirement and has completely lost faith in the Greek government and its agencies. He is determined to investigate the murder fully and bring the culprit to justice. On arrival in the north, he quickly discovers that there is a flourishing brothel close to the wall, which is patronised by officers of Frontex, the international military body who guard the frontier, the different nationalities having a rotor of duties. The body belonging to the head is swiftly discovered in the undergrowth. A very young Russian prostitute has been arrested for the crime as she was discovered in a hysterical state and in possession of an axe. When Evangelos interviews her he finally persuades her to tell her story. Back in Russia she had been determined to earn sufficient money to buy herself a house and had been persuaded by people smugglers to come with them to work as a prostitute in Greece, where she could earn a lot of money. She had been brought to the Greek/Turkish border and forced to work in the brothel, where she was given drugs and made to take part in orgies with the Frontex officers. She insists she did not wield the axe herself, but a man with whom she struggled during her flight may have done. This man, Nikolaus Strom's, story now forms a large part of the narrative. He is half German and half Greek, and is the owner of a German fencing contractor, who has put in a quote to build the fence for a much smaller sum than the company to whom the contract has been awarded. He claims that on the day of the murder he had a meeting to discuss his quote with a Greek military officer who failed to turn up. When he realises he is under suspicion for the murder he manages to escape from custody and sets off towards the border with Bulgaria. Evangelos pursues him, but soon realises that Strom is not going to be charged with the murder (of which he is certainly innocent), but with spying. He knows this is not true, but doggedly carries on. Evangelos's dilemmas and the strength and weaknesses of his character are vividly brought to life. But it is the sheer poetic beauty of the writing (despite the sleaziness and brutality of the storyline), and the haunting descriptions of the landscape, that remain solidly in the mind.